October 24 is an international day of climate action. Here is the message from 350.org. This is an invitation to build a movement—to take one day and use it to stop the climate crisis. We are a group of people from around the planet—young and old, scientists and writers and activists—who have one thing in common. We know the most important number on earth: 350. And we know how to use that number to finally get global action on the worst crisis humans have ever faced. But we can only do it if you help. The bad news: We’re already past that number—we’re at 390 parts per million, which is why the Arctic is melting, why drought is spreading across the planet, why people are already dying from diseases like dengue fever and malaria occurring in places where they’ve never been seen before. The good news: that number gives us a target to aim for. When the world’s leaders meet in Copenhagen in December to reach agreement on a new climate treaty, we need them to go farther than they’ve planned to go: we need to make sure they’ll pay attention to the latest science and put forward a plan that gets us back to safety. So here’s the plan. On October 24, we need you to organize an action in the place where you live, something that will make that most important number visible to everyone. People in more than 1000 communities around the globe have already announced plans—they’ll be school children planting 350 trees in Bangladesh, scientists hanging banners saying 350 on the statues on Easter Island, 350 scuba divers diving underwater at the Great Barrier Reef, and a thousand more creative actions like these. 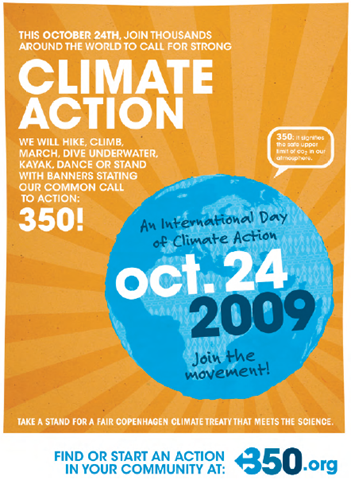 At each event, people will gather for a big group photo that somehow depicts 350—and upload that photo to the web 350.org. As actions take place around the world, we’ll link all the pictures together electronically via the web–by the end of the day, we’ll have a powerful visual petition linking together the entire planet that we can deliver to the media and world leaders. So far more than 150 nations are taking part—it’s shaping up to be to be the biggest day of grassroots action on global warming ever. But we need it to be much larger—we need you, in your village or town or city, to take part. It’s not hard—we can help you with materials and ideas. But you need to take the first step, by registering an action and starting to let your friends and neighbors know about it. Involve groups that you’re in—everything from your church, mosque or synagogue to your local bicycle group. People want to help, especially if they see the chance for something that might actually matter. This is even more important than changing your lightbulb—this is your chance to help change the way the whole world operates. October 24 comes six weeks before those crucial UN meetings in Copenhagen. It’s a great chance to take a stand—maybe the last great chance, given what the scientists tell us about the momentum of global warming. It can only happen with the help of a global movement—and it’s starting to bubble up everywhere. Farmers in Cameroon, students in China, even World Cup skiers have already helped spread the word about 350. Churches have rung their bells 350 times; Buddhist monks have formed a huge 350 with their bodies against the backdrop of Himalayas. 350 translates across every boundary of language and culture. It’s clear and direct, cutting through the static and laying down a firm scientific line. This is like a final exam for human beings. Can we muster the courage, the commitment, and the creativity to set this earth on a steady course before it’s too late? October 24 will be the joyful, powerful day when we prove it’s possible. Please join us and register your local action today. P.S.—We need you to do something else, right away, that’s pretty easy. Please forward this message to anyone you know who is even remotely appropriate. For more details, log on to 350.org.